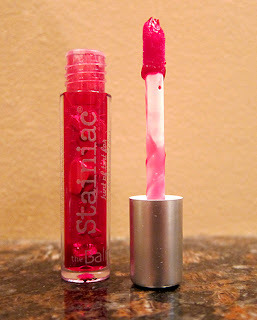 THE SKINNY: theBalm's Staintastic in Beauty Queen is a redish-pinkish gel packaged like a lip gloss. It's meant for either your lips or your cheeks. Don't be afraid of this color. It looks much darker than it goes on. The gel goes on smoothly and, because it's water-based, dries almost immediately. It's fairly easy to apply and because it's so light, you don't have to be very precise when applying it. My fair skin has got a good summer glow on it these days, so one applications gives the apple of my cheeks a subtle rosy tint. Layer applications for more impact. It's much lighter than powder blush or bronzer and especially useful in these hot summer months. This product comes in three shades: Beauty Queen plus a lighter pink and a bronze. KEEP OR TOSS: Keep. It's a great option to add a little color on hot, humid summer days. CHECK IT OUT: Get tips on how to use this product online.